Genetically-modified olive flies will be released in a Catalan olive grove if a field trial proposed by British biotech company Oxitec is approved in Spain. According to German expert group Testbiotech, which opposes the trial, it would be the first release of GM animals in the European Union. The olive fly – Bactrocera (Dacus) oleae – is one of the key pests affecting olive cultivation and is managed mainly via pesticides. Oxitec believes its modified olive fly strain – called OX3097D‐Bol and developed about three years ago – offers a more effective, chemical-free solution. After what is says were promising greenhouse trials, Oxitec seeks approval to release its flies about 8 km from the port in Tarragona, one of Catalonia’s main olive oil production regions. It’s understood that six nets would each cover various trees and the trial would last 2-3 months. Oxitec says it want to test the mating competitiveness, longevity and persistence of the fly in the field. In information sent to the European Commission in January, Oxitec said only males would be released. On mating with wild females, any resulting female offspring would fail to develop beyond the late larval stages. “No significant interactions are anticipated. The modification is limited to the olive fly by reproductive barriers. In the event that the OX3097D‐Bol olive fly is eaten by predators present at the release site the inserted genetic traits are not anticipated to have any toxic effect,” it also said. A spokeswoman for the Catalan Ministry of Agriculture, Livestock, Fisheries, Food and Environment told Olive Oil Times that Oxitec’s application had been referred to the Catalan Biosafety Commission. Before any decision was made, an exhaustive risk assessment of the proposed trial, a 30-day public information period, and consultation with experts and stakeholders were among steps required, involving both the Catalan commission and the Spanish National Commission of Biosafety. She said the company was interested in using about 48 olive trees in Tarragona over an area of about 0.16ha and had indicated that it had also applied to release its flies in Italy and Greece. Oxitec has yet to reply to requests from Olive Oil Times for more information. However, Oxitec CEO Hadyn Parry told Spanish media that because female offspring of the Oxitec strain fail to reach adulthood, “they can’t mate and the plague gradually disappears.” And in an article published in January, Michael Conway, a PhD student at the University of Oxford and Oxitec, said that in recent greenhouse trials, “Oxitec’s modified olive fly strain proved itself a highly effective weapon, totally eliminating a wild-type population in less than two months.” “It is an approach that we are confident is more economic, greener, and more sustainable than any existing alternative,” he said. 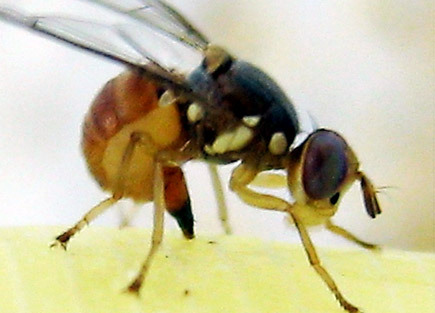 Public interest scientific group Testbiotech’s spokesman Christoph Then said among the group’s fears was that male descendants of the GM flies, which unlike the females could mate and propagate further, would escape and spread without control. “If the genetically engineered flies escape, the harvest in the regions concerned would become non-marketable. Genetically engineered larvae living inside the olives are not allowed for food consumption in the E.U.” “The Oxitec insects are manipulated with synthetic DNA, which is a mix of maritime organisms, bacteria, viruses and other insects. It is not known how these insects will interact with changing environmental conditions, so far they have only been bred in the laboratory,” he said.